For the past two and a half weeks, I was in trial. Just in case a juror might have found this website, for the most part I stopped blogging. Instead, I wrote daily trial diaries. Those were sent to my family, friends and colleagues. They were not posted publicly on the internet. I think that's the safest way for a trial lawyer to deal with their blog. 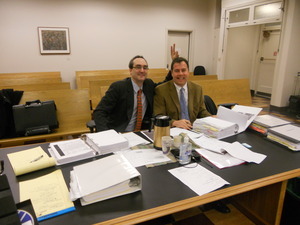 Now that trial is over (and yes we did well), I thought you might like to see a few pictures. This was Steve Hay's case. He graciously invited me to try it with him. We had a great time. It is always a pleasure to try a case with a good lawyer. Plus see all those papers. He took care of all that. The two defense lawyers were Andrew Stanton and Todd Bowers. They represented two different people. This is the second trial I've had against Andrew. The WSBA will be pleased with me. I was quite civil. Sure, there were a few times when Todd in particular was a bit naughty. And we had to be hmmm... stern... with a few of his witnesses. But otherwise both lawyers were professional and good to work with. They also had a nice sense of humor.